This easy circular town walk is just over 4Â½ miles and although it can be completed in under two hours it is better to take at least a half day, so that you can explore some of the historical sites along the way, linger in the attractive parks and enjoy the tranquillity of the Grand Union Canal and River Leam. There are numerous opportunities for refreshment along the route or you may prefer to complete the walk and try the Newbold Comyn Arms. A few web links to the various amenities have been included in the text below. For the first part of the walk, you will enjoy a short section of The Millennium Way where it passes through Leamington Spa Find out more about the walk by clicking on the information icon. Exit from the car park adjacent to the Newbold Comyn Arms and turn right In the direction of Leamington to go past the Newbold Comyn Leisure Centre on your left. Walk on wide tarmac footpath on left side of road, enjoying trees left. Watch for Newbold Terrace East, then after a few paces trees end on your left, go diagonally1/2 left across grassy strip to walk with shrubs and trees left. At the corner, by a waypost, enter the tree line, and follow path left down to the corner gap to find Willes Road. Cross road and take entrance opposite into Jephson Gardens ( signposted riverside walk. ) Continue through Jephson Gardens on the path directly ahead, (Pass Aviary Cafe and Garden Glasshouse [Free entry]) keeping to right of lake to exit opposite The Royal Pump Rooms. Go left on road to pass over bridge and take first road right (Spencer Street) opposite All Saints Parish Church. Go left on Lower Avenue, pass under railway bridge to find junction of roads then go ahead on right hand side of Tachbrook Road. After some 50 yds, before bridge, take entry to tow path on right. Go down onto tow path and turn right (do not go under Bridge 41). Go along tow path of this pleasant section of the Grand Union Canal and after approx ½ mile go under bridge 42 then immediately right to meet the main road (Old Warwick Road). Here you leave The Millennium Way. Walk right along road for a little way to safely cross via pedestrian crossing then left towards roundabout and follow pavement, turning right down Princes Drive. Stay on wide pavement down Princes Drive under railway bridge to reach viaduct spanning the roundabout. Go under right hand arch viaduct and cross safely over Park Drive via the pedestrian crossing. Enter Victoria Park immediately ahead then take the left-hand path towards play area. Just before reaching the play area cross grassy area to reach riverside path. Stay with River on left (River Leam) and pass the play area, and then the riverside cafe. Shortly you will reach a waymark post (by the Bowling Green) here the path forks. Take left fork to go under road bridge. Walk through short tunnel and continue on path to flight of steps. Go down steps and turn immediately left across bridge then right to continue along path with river right, follow round path with rear of Royal Pump Rooms on right to reach main road. Turn right (Just before the bridge the stone drinking fountain offers opportunity to try Leamington famous spa water). Go ahead over the bridge, past All Saints Parish Church on other side of the road. Stay ahead passing The Old Library pub on left and continue ahead over traffic lights and under railway bridge into Clemens Street. Keep ahead to find bridge over canal and just before bridge take the narrow gap left, by the railings on opposite side of road, and drop down onto the towpath of the Grand Union Canal to go left and walk with the canal right. Stay on towpath for just under a mile passing under bridge 38, 37(a) and 37. Approx ¼ mile past bridge 37 keep a lookout for an exit left and take the steps down to join the main road. Turn left along main road and cross over to opposite pavement continuing along with hedge right. After approx 200yds take the path right (signed Riverside Walk) to walk through small parking area. Stay ahead to cross wooden footbridge over River Leam to enter Leam Valley Local Nature Reserve. Immediately after bridge go left just in front of the information board and follow the track keeping river on left. Where the track forks, stay left and take the metal kissing gate directly ahead, then cross small bridge. Here you leave the river as it bends left and walk fairly steeply uphill to enter a children's play area. Continue through the play area passing the red painted swings to reach the access road, then turn left. 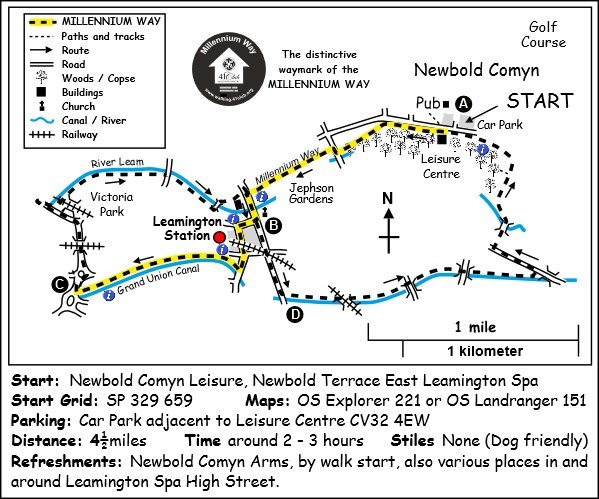 Shortly you will arrive back at your starting point near the Newbold Comyn Leisure Centre. Jephson Gardens are named after Dr Henry Jephson who promoted the healing properties of the spa thus ensuring the town’s growth. In the park is a Corinthian styled temple inside of which is a statue of the good doctor. Dr Hitchman is remembered in a fountain as he commissioned the temple and employed the poor of the town to build it. Edward Willes who donated the land is remembered with an obelisk and indeed by the road you must cross at the eastern end of the park. The tea rooms used to be an aviary but were rebuilt with funding from Cadburys. 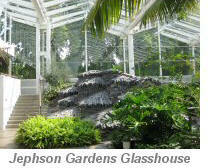 The new subtropical greenhouse was built with Heritage Lottery money. 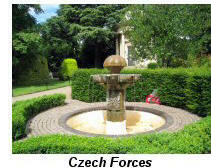 A significant memorial stands for the Czech forces stationed in Leamington during WW2. A three times mayor of the town Cllr Davis is commemorated with a clock tower. If time allows take time to visit the sub tropical glasshouse in Jephson Gardens known as the Temperate House which it is claimed seeks to represent plant evolution from approximately 500 million years ago,. The Grand Junction Canal built between 1793 and 1805 and after the acquisition and amalgamations of several companies along the route from Birmingham to London it became the Grand Union. Through the hedge on the towpath side and across the road is the now defunct Ford Motor Co foundry. At this point you will notice the canal bears off to the left and goes under a new bridge. In the 1980’s the main road was widened and the canal was moved for a distance of 400m to allow for the building of a roundabout. The new pub the Moorings recreates the old world of life on the canals with its curry nights and wide screen Sky sports. 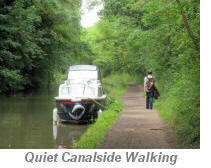 The canal first crosses the GWR line to Birmingham Snow Hill built by Brunel and secondly the river Avon. Looking east on the bridge towards the town you just cannot see the confluence of the Leam and Avon. Your researcher thinks the myriad of fish visible below are eels. At the junction of Spencer Street and Lower Avenue look beyond the Moat House and in the gardens the game of lawn tennis was invented in 1872 by a Major Harry Gem a Birmingham solicitor. 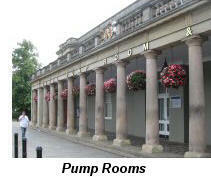 The railways came to Leamington in 1844 (London North Western Railway) and 1852 (Great Western Railway). In March 1851 the LNWR opened another branch, this time from Rugby, which ran through Leamington and made an end-on connection to the Coventry branch at Milverton. ( just north of Guys Cliffe) Although the new line ran briefly parallel to the route of the Great Western Railway's Birmingham to Oxford line, which was then under construction in southern Leamington, and within spitting distance of the more central GWR station which opened in 1852, the LNWR did not open a station of its own alongside the GWR station until February 1854. This was evidently a somewhat hastily constructed timber affair: a more permanent brick-built station followed in 1860. The Coventry line closed under Beeching but the evidence of the old bridges are adjacent to the current main line north of the bridge in Lower Avenue.